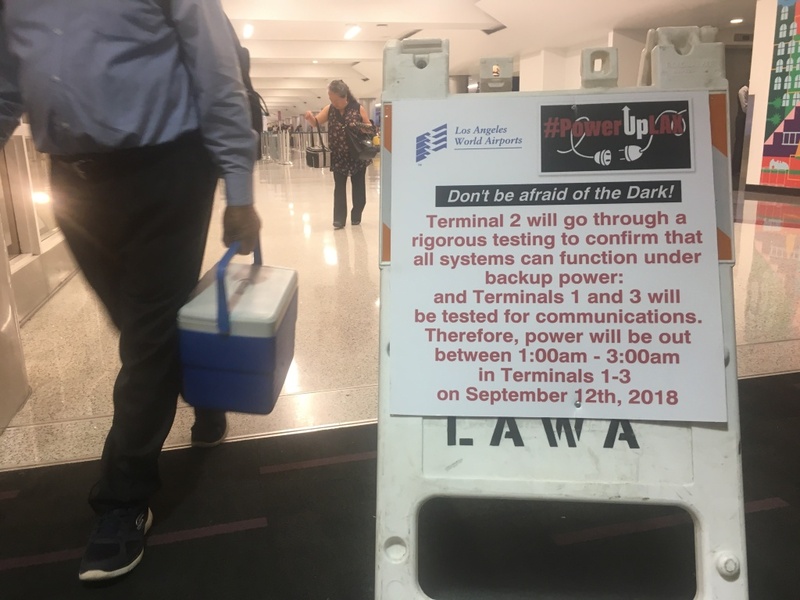 A worker carrying a cooler walks by a placard informing passengers of a power systems test at LAX Terminal 2 early Sept. 12, 2018. If a regional blackout hit LAX, only two of the airport’s terminals have the backup power systems sufficient to keep planes and passengers moving. Early Wednesday, airport operators cut off power to Terminal 2 to test how well it could function on backup power. The verdict – it can, but not everything re-starts right away. Elevators, escalators, baggage conveyors and some TSA screening equipment – all those have to be manually rebooted. The other terminal with backup power is Tom Bradley International. A similar overnight power shutdown test will be done there Oct. 31. Another backup power system will be installed in the new satellite terminal being built out beyond the Bradley terminal.